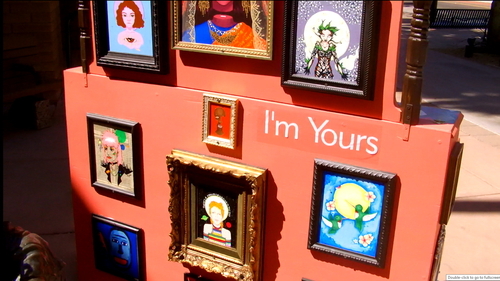 Community Group: New School For The Arts. 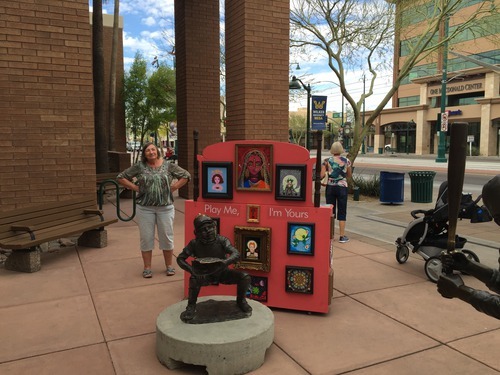 Artist: Kyllan Maney & Students. Donated by: Myrna Horton. 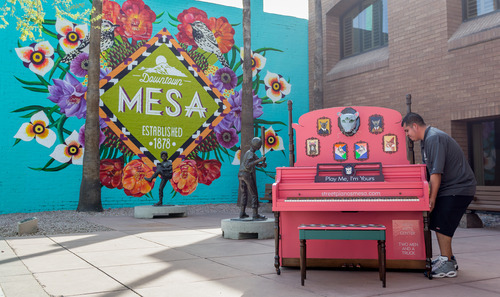 Passing through Mesa Arizona last week to check out the remaining street pianos. I thought this cat inspired piano was really cool. Just playing a little blues improv before heading to Sedona Arizona. David - wearing shades in the shade. Having his portrait taken at the portrait piano. David playing "You'll Never Walk Alone" on his 16th Street Piano. 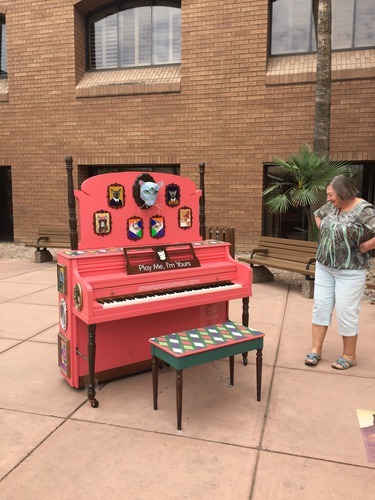 This piano was in a nice shady area on Main Street East of MacDonald. 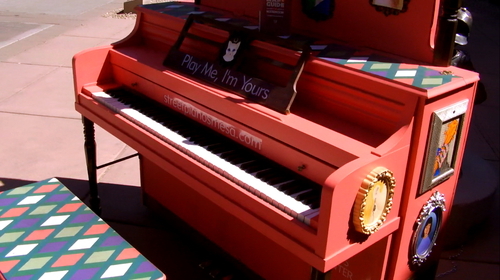 Very colorful piano and location :) Did you see his Carnegie Hall Tee? 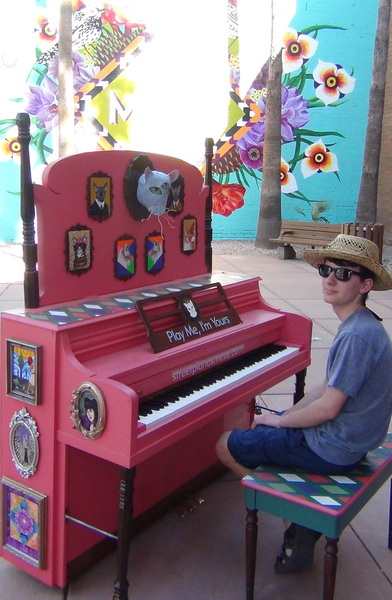 David, 16, playing "Memory" on his 16th Street Piano. 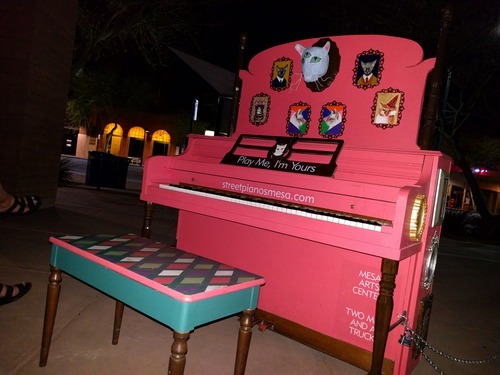 Thought it an appropriate one to play on this pink piano with cat portraits on the front. Watch for the breeze that messes with his sheet music and David's reaction :) For the ending some of the keys that were needed were not working, so he jumps an octave to find keys that would play! 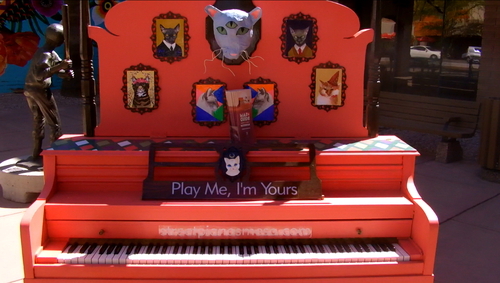 The four-eyed cat streetpiano #6 Meow! 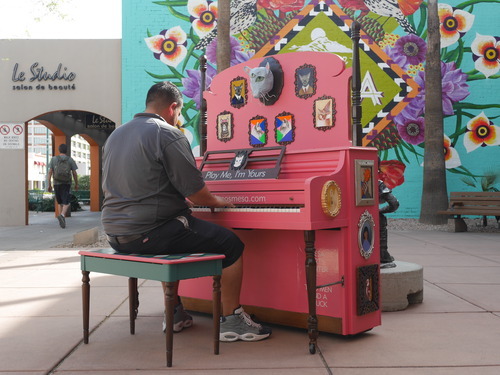 Working on my goal to play all of the street pianos set up for the Street Piano project in Mesa. My goal is to play every one and use a different song on each one. This #4 for me. Does it feel like someone's watching? An original score by composer Michael Howard. Check us out at www.facebook.com/OriginalMusicScores for more content!